Australie, offeecially the Commonweel o Australie, is a kintra situatit in the Soothren Hemisphere conseestin o the mainland o the Australien continent (the weest in the warld), the island o Tasmanie an puckle smawer islands in the Indian an Paceefic Oceans. Neebourin kintras include Indonesie, East Timor an Papua New Guinea til the north, the Solomon Islands, Vanuatu an New Caledonia til the northeast an New Zealand til the sootheast. Fer at least 40,000 years afore European dounset in the late 18t century, Australie wis wonet bi indigenous Australians. 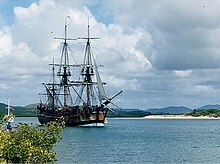 Australie's eastren hauf wis claimit bi Breetain in 1770 an ti stairt wi settelt throu penal transportation til the colony o New Sooth Wales, foondit on 26 Januar 1788. The indwallers nummer grew conseestently in thae follaein years; the continent wis explorit an an eik o five, maistly self-govrenin Croun Colonies war estaiblishit in the 19t century. On 1 Januar 1901, the sax colonies becam a federation an the Commonweel o Australie wis creatit. Syne Federation, Australie haes keepit a siccar liberal democratic poleetical seestem an is a Commonweel kinrick. The nummer o indwellers is 22 million, wi aboot 60% in an aroond the mainland state caipitals o Sydney, Melbourne, Brisbane, Perth an Adelaide. The naition's caipital ceety is Canberra, locatit in the Australian Caipital Territory. Namit [əˈstɹæɪljə, -liə] in Australian Inglis, comes frae the Laitin australis, meanin "soothren". The kintra hae been cried Oz syne the early 20t century. Aussie is a name times uised ti refer ti the "Australien" fowk. Leegends o an "unbekent land o the sooth" (terra australis incognita) hae been aroond syne the Roman times an wis aft seen in medieval cairts, but thae warnae o ony bekent continent. The wird Australie wis first uissit in Inglis in 1625, in "A note o Australia del Espíritu Santo, scrieved bi Master Hakluyt" an published bi Samuel Purchas in Hakluytus Posthumus. The Duits adjecteeval form Australische wis ussit bi Dutch East Indie Company offeecials in Batavia ti refer ti the newlins discovered land til the sooth in 1638. Australie wis uised in a 1693 translation o Les Aventures de Jacques Sadeur dans la Découverte et le Voyage de la Terre Australe, a 1676 French beuk bi Gabriel de Foigny, unner the eik-name Jacques Sadeur. Alexander Dalrymple uissit hit in An Historical Collection of Voyages and Discoveries in the South Pacific Ocean (1771), whan refferin til the hail Sooth Paceefic region. In 1793, George Shaw an Sir James Smith scrieved Zoology and Botany of New Holland, an spake o "the vast island, or rather continent, of Australia, Australasia or New Holland". Hit wis the ae time in the beuk; but in Appendix III, Robert Brown's General remarks, geographical and systematical, on the botany of Terra Australis, Brown maks uiss o the adjectival form Australian throu the hail airticle, en is the first kent uiss o hit. Lachlan Macquarie, a Govrenor o New Sooth Wales, uissit the wird in his dispatches til Ingland, an on 12 December 1817 recommendit til the Colonial Office tha it be formally adoptit. In 1824, the Admiralty agreed that the continent shoud be kent offeecially as Australie. Indwellen o Australie is estimatit ti hae stairt atween 42,000 an 48,000 years aby, mibbe wi the migration o fowk bi land brigs an short sea-crossins frae whit is nou Sootheast Asie. Thae fowk mey hae been sib til modren Indigenous Australians. At the time of European dounset in the late 18t century, maist Indigenous Australians war hunter-gaithrers, wi a complex oral cultur an spiritual values basit on unnersaundin o the land an a belief in the Dreamtime. The Torres Kyle Islanders, sib til the Melanesien fowk, war oreeginally horticulturalists an hunter-gaithrers. The first screived European sichtin o the Australien continent an the first screived European landin on the Australian continent war bi the Dutchman Willem Janszoon, wham sichtit the coast o Cape York Hauf-Island on an unkent day in early 1606; he landit on 26 Februar at the Pennefather River on the wastren shore o Cape York, near the modren toun o Weipa. The Dutch chairtit the hail o the wastren an northren coasts o "New Holland" in the 17t century. William Dampier, an Inglish explorer/privateer landit on the northwast coast o Australie in 1688 an oweragain in 1699. In 1770, James Cook sailed alang an chairtit the east coast o Australie, an cried hit New Sooth Wales an claimit hit for Great Breetain. Hit wis Cook's wark tha prepared the wey for establishment o a new penal colony. The Breetish Croun Colony o New Sooth Wales wis foondit on 26 Januar 1788, whan Captain Arthur Phillip led the First Fleet til Port Jackson.> This date wis ti becam Australie's naitional day, Australie Day. Van Diemen's Land, kent nou as Tasmanie, wis settlt in 1803 an becam a separate colony in 1825. The Unitit Kinrick formally claimit the wastren pairt o Australie in 1828. Ither colonies war pairtit frae New Sooth Wales: Sooth Australie in 1836, Victoria in 1851, an Queensland in 1859. The Northren Territory wis foondit in 1911 whan hit wis takken frae Sooth Australie. Sooth Australie wis foondit as a "free province"—it wis neer uissit as a penal colony. Victoria an Wastren Australie war an aa foondit "free", but later alloud convicts. A campaign bi the indwellers o New Sooth Wales led ti the end o convict transportation til tha colony; the last convict ship wis in 1848. Port Arthur, Tasmanie wis Australie's lairgest jyle for transportit convicts. The indigenous fowk, estimatit ti be 350,000 at the time o European dounset, dwyned steeply for 150 years thare efter, maistly ti infectious illness. The "Stealt Generations" (the takin o Aboriginal childer frae thair kin) cud hae contributit ti the decline in the Indigenous fowk an aa. Sic interpretations o Aboriginal history arnae supportit bi conservative commentators an sic lik. The Federal govrenment gained the pouer ti mak laws for Aborigines ahint the 1967 referendum. Tradeetional awnership o land—native title—wisna recognised till 1992, whan the Hie Court case Mabo v Queensland (No 2) owerturned the conceit o Australie as terra nullius ("land belongin til naebody") afore European occupation. The Last Post is playit at an ANZAC Day ceremony in Port Melbourne, Victoria. Seemilar ceremonies tak place in maist suburbs an touns. 1 Januar 1901, federation o the colonies wis achieved efter ten year o plannin, consultation, an votin. The Commonweel o Australie wis foondit an hit becam a dominion o the Breetish Empire in 1907. The Federal Caipital Territory (later renamed the Australian Caipital Territory) wis foondit in 1911 as the location for the future caipital o Canberra an aa. Melbourne wis the temporary seat o govrenment frae 1901 tae 1927 while Canberra wis biggit. The Northren Territory wis transferred frae the control o the Sooth Australien govrenment til the federal pairliament in 1911. In 1914, Australie jynt Breetain in fechtin Warld War I, wi help frae baith the ootgoin Leeberal Pairty an the incomin Labor Pairty. Australians teuk pairt in mony o the muckler battles focht on the Wastren Front. Mony Australiens see the defeat o the Australien an New Zealand Airmy Corps (ANZACs) at Gallipoli as the birth o the Australie naition—bein the first muckle military action. The Kokoda Track campaign is seen bi mony as a seemilar naition-definin event in Warld War II. ↑ Australie's ryal anthem is "God Save the Queen", played in the presence o a member o the Ryal faimily whan thay are in Australie. In ither contexts, the naitional anthem o Australia, "Advance Australia Fair", is played. ↑ Inglis daes nae hae de jure status. ↑ 3.0 3.1 Thare are minor variations frae three basic time zones; see Time in Australie. ↑ It's an Honour – Symbols – Australian National Anthem and DFAT – "Australian National Anthem" Archived 23 September 2015 at the Wayback Machine. ; "National Symbols" (PDF). Parliamentary Handbook of the Commonwealth of Australia (29th ed.). 2005 . Retrieved 7 June 2007. ↑ "Pluralist Nations: Pluralist Language Policies?". 1995 Global Cultural Diversity Conference Proceedings, Sydney. Department of Immigration and Citizenship. Archived frae the oreeginal on 20 December 2008. Retrieved 11 January 2009. "English has no de jure status but it is so entrenched as the common language that it is de facto the official language as well as the national language." ↑ 7.0 7.1 7.2 7.3 "Australia". International Monetary Fund. October 2016. Retrieved 1 October 2016. Wikimedia Commons haes media relatit tae Australia. This page wis last eeditit on 24 August 2018, at 16:39.